Francis Chantrey was born in 1781 in Norton, North Derbyshire, son of Francis, a farmer and joiner, and Sarah, daughter of Martin Legatt, a joiner from Okeover near Ashbourne in Derbyshire. Chantrey became one of the most important sculptors of the early 19th century. Initially apprenticed to a carver and gilder called Ramsey, Chantrey was taught drawing lessons by John Paphael Smith, a noted engraver, who had taken a liking to him. He started his career as an artist painting portraits but soon moved on to sculpturing. In 1809 he exhibited a head of Satan at the Royal Academy which led to commissions to make busts of Nelson and other admirals for Greenwich Hospital. He became so enormously successful with his portrait busts, statues and church monuments that he managed to amass a great fortune and was knighted in 1835. 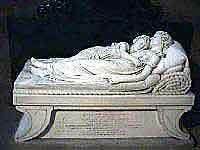 Among his many statues and monuments are the Sleeping Robinson Children (1817) in Litchfield Cathedral, Queen Victoria in the National Portrait Gallery, William Pitt in Hanover Square and George IV in Trafalger Square, London. There is also a George Washington in Boston State House, USA. 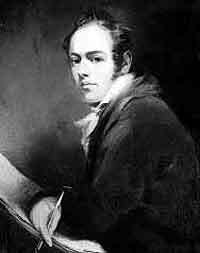 He had married his cousin Mary Ann Wale in 1802 who brought a dowry of £10,000 into the union which Chantrey used to buy houses and set up a studio. When he died, he left the bulk of his large fortune to the Royal Academy to purchase British works of art. The collection is now in the Tate Gallery, London. Chantrey was buried in his native village of Norton, North Derbyshire.